When I originally did these nails, I was so excited I immediately had to share them on Instagram, and they remain my third most liked design on IG! I used the 2013 Color Club Halo Hues for this drag marble. The holo effect seems to not be nearly as evident when you use these in nail art instead of alone for some reason, but I still love how they turned out! The heart necklace I'm holding in the last pictures is one I found on Polish and Charms' Etsy shop and I had to have it! I figured the silver holo in it would compliment these nails well for an awesome holo party! I had originally done a warm and cool water marble with this collection, filmed it, but wasn't too fond of it. So I switched to a drag marble. 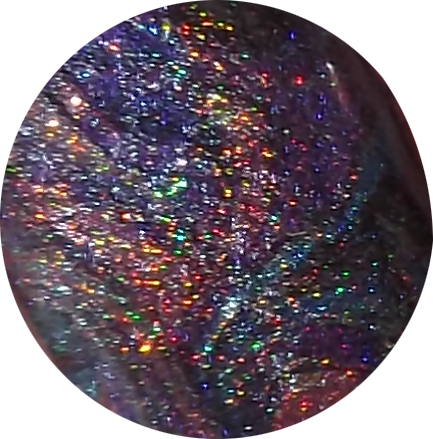 I'm not going to do a post on the water marble, though, but I'll include the video for them in this post just in case you're curious.